The layer of pink was like frosting atop the white cake of the soda lake beach. Above the pink line, the air rippled in the African heat and dozens of figures hovered, darted and landed in the scene, flickering like birthday candle flames floating above the lake. That lake was Nakuru, home of the first national park in Kenya, and the pink frosting was a layer of hundreds of thousands of pink birds, the “lesser” flamingoes that gather at Kenya’s caustic soda lakes to dine on the voluminous algae. Inside the microscopic algae is a pigment that makes the birds’ feathers pink. Looking out across the lake, especially through a long lens that compressed the100-degree heated air, the scene appeared as a mirage. But as you walk closer, the harshness of the environment starts to become clear. When you breathe in the white chalky dust from the beach, it stings your nostrils. If we were to step into these waters, the alkaline stew would burn our flesh like stepping into a bucket of lye. But the birds have a coating on their legs and beaks so they can walk in the shallow waters of the lakes and dip down to scoop algae, sifting it in their mouths. I was there to produce a World of Audubon special, a co-production with the BBC Natural History Unit. My best TV pals Peggy and Greg were there, along with the presenters from the Beeb, who are arguably some of the smartest TV hosts on the planet. They had logged countless hours in the African bush, and really knew their stuff, even deducing which animal had killed the waterbuck behind my tent one night. It was a leopard, they surmised. We — Peggy, Greg and I — were part of an environment-themed news magazine on Turner Broadcasting, a show that had taken us around the world to rainforests and toxic waste dumps, urban brownfields to wide open spaces. But this was a chance to become instant naturalists, learning from some amazing experts on the ground, and, for me, to see the great African fauna for the first time. Lake Nakuru National Park is fenced in, and features almost all the major animals except hippos and elephants. Lions and leopards lurked in the bush. Driving into the grasslands behind the lake, we would see Rhinos grazing and, one evening, we shined our headlights on cheetahs gorging on an antelope, with jackals in the background, looking for room to nose in and get a bite. For the Audubon special, we had live cameras at lakes Nakuru and Elmenteita, as well as Lake Bogoria to the north. Bogoria is rich with geothermal activity, with lots of hot springs and geysers (in fact, it’s been said the park features the largest number of geysers in Africa). That lake, much more caustic than Nakuru, is devoid of aquatic animal life (no fishing there). But the flamingoes come for the algae, and the fish eagles and steppe eagles come for the flamingoes. The flamingoes may have safety in numbers, but the keen hunting skills of the eagles would still win out, diving and clutching a flamingo in their talons and flying off to feast. 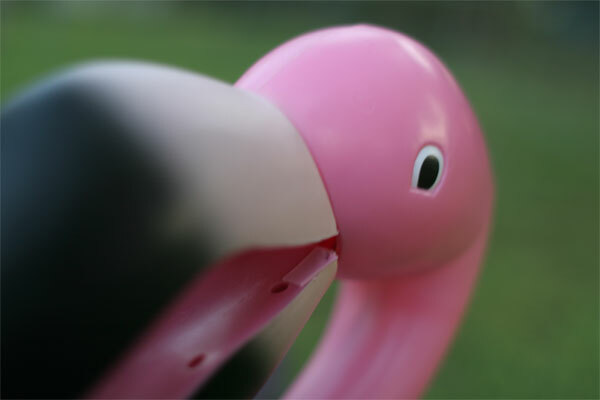 The program we were producing, called Flamingowatch!, was to be a live special in prime time. And, because Kenya is eight hours ahead of Eastern Time, it meant our show would begin at dawn. In the weeks leading up to the broadcast, the team produced live programs for young people that were close-circuit broadcast in the states, including a science curriculum to go along with it. But all those shows took place in the late afternoon, when the park was crawling with hungry wildlife, so much so that you’d want to hum tune of The Circle of Life to yourself as you watched it play out. But 6:30 a.m. was a different story. One morning before the broadcast, Jonathan, the Senior Producer, and I woke early to scope out what the light and environment were like at dawn. When we woke, our driver was nowhere to be found, so Jonathan suggested we walk the quarter mile to where the master control center was (actually a big tent filled with a television control room). “But there are lions in this park,” I said. Jonathan, who grew up in Africa and went to boarding school in Zimbabwe when it was still called Rhodesia, was unruffled. “I’m not afraid of lions,” he said, and started walking to the road. Or baboons and leopards, I thought to myself. Or any other number of creatures with big teeth and claws. The rangers told us that lions don’t bother with people in a jeep or land rover, because they see it as a big, metallic animal that isn’t a threat or food. But something walking on two legs is a different story. Jonathan brushed him aside and we walked ahead to scope out the morning light. What we discovered in the live program was a park full of animals just emerging from slumber. The lions were all just waking up, the crew was just as bleary-eyed, and the flamingoes were lethargic in the morning light. As a wildlife program, it was going to be a bit of a yawn. 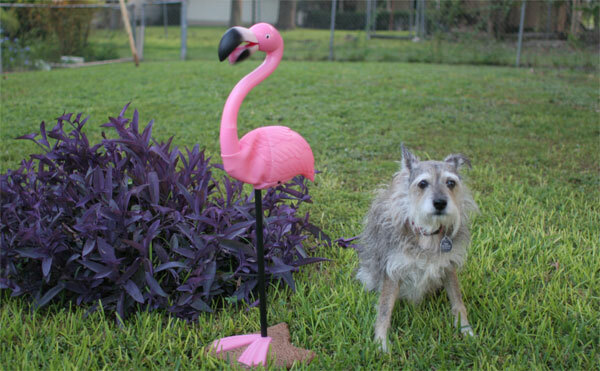 One feature story in the hour explained the history of the kitsch icon, the plastic pink lawn flamingo. It was created by a guy who, aptly enough, has the word feather in his name: Don Featherstone. And those lawn ornaments had also played a role in a Duff family tale, a story that involves a young man facing weddings, flight from hostile neighbors, and a brush with law enforcement. And it explains why a grown man would buy his 44 year-old son a singing pink flamingo as a birthday present. It has nothing to do with Africa. But that story will have to wait a little longer. OK Craig, I didn’t expect you to hi-light this in your blog. Just wanted to chuckle one more time about it. And a good chuckle your Dad and I had when we discovered the’ bird ‘in the store and purchased it. Did Dad give you the little one to carry in your pocket for luck? What about the frozen G.I. Joes????? Cheryl, guess Dad forgot about the little pocket bird. And Laura will be taking care of the singing flamingo for a while — it wouldn’t fit in my luggage, and the sublet I’m in is too tiny for both of us. And, John, there are some secrets from my youth that shall remain secret! I was just Googling some of my old peace corps friends and locations, when I ran across your post. I spent a lot of time in Nakuru, and had heard the lake was drying up, littered with dead flamingos, rife with armed poachers, etc. I was glad to read your accounts of its present vitality. The strangest thing that ever happened to me there was when I sprained my ankle on a python, back in 1976. I was stationed in Thika Kenya. I came to visit another volunteer in Nakuru one weekend. Saturday afternoon we were drinking Tusker Lagers and playing soccer in a field next to his house. The ball was kicked into a small ravive, and I jumped down to retrieve it. Only thing was, when my right foot hit the ground, the ground was not solid, and I felt my ankle twist and crack just before I crumpled to the ground screaming like a little girl. I propped myself upright as my friends arrived, I t was then noticed the leaves in the gulley bottom were moving. It was a python, about 12 – 15 feet long, under the leaf cover that I had jumped on, about 2/3 towards the tail, I must have hurt it and it was doing its damnest to get away from me! Lucky he was headed away, as lying on the ground hurt as I was, I would have been in a lot of trouble, had he decided to turn and attack. We watched it effortlessly climb a tree, and stayed there untill after nightfall, no doubt each of us keeping a wary eye on the other. Thanks, veeguy, for your comment regarding Nakuru. Wanted to let you know that I have no idea what the current state of Lake Nakuru or the park is. It’s likely that it is as your friends described. I was last there in the mid-90s. But thanks for writing and for telling the story about your adventures there.